What’s your guilty pleasure? Massages…I wish I could get one a month! What inspires your work? Antique quilts and my garden, nature and architecture. What’s on your night stand? Two pictures, one of my Dad & me and then one of my three boys when they were little making a sand castle on the beach. Do you sing when no one else is listening? Yup…right now I am singing Dirt Road Anthem and Don’t you wanna stay…I am getting ready to see Jason Aldean someday….I will know all the words…by then. Tell us about your pet…Jeets (Jeter, after Derek Jeter of the NY Yankees) and Prez (Presley after the KING). The two handsome dudes are the best dogs we have ever had…come and see them when you visit Primitive Gatherings! How many quilts have you made? A lot…but not enough yet…. Below is my project for the Blog Hop…a little “Thread Catcher” for all of your thread ends or tails…. My block pattern and recipe are also here Lisa recipe and block These cookies are great and easy to make…they contain oil instead of butter and only have a few ingredients! The Blocks we have all contributed have been stitched in a quilt made by Lissa A….here it is it is so beautiful…it uses a lot of fabrics from our latest lines….mine is the top left…also here are a bunch of my new friends…these Moda girls are a blast to hang out with at market! Next Post the winners are!!!! Thank you for your generosity! I love the log-cabin variation quilt in the photo. This has been really fun to read the blogs and hear about the county fairs. Farm animals, quilts and food all make the fairs something to remember. Cool photo’s ~ pictures of the doggies are cute! Your dog’s are so cute. thanks for the pattern. Love your new lines of fabric. Great puppy pics, thanks for the free pattern, it’s so cute! Qué fotos más bonitas !!!! Muchas gracias por el blog y por el sorteo. love the pattern for the thread catcher…thanks!! It is my birthday today and guess what – the first present I opened was “The Farmers Wife Sampler Quilt”, so I cannot wait to get started on some of these blocks. Thank you for your project. What a great chance to win, I have really enjoyed this blog hop, thanks for taking the time to make it happen. Really enjoyed looking at your photos. Love the thread catcher pattern. Definitely on my list of TO-DO’s. I love the little thread catchers, I need to make one for my mom and myself. She hand pieces quilts and I am working on my first grandmothers flower garden and that thread catcher will come in handy. Oh yes and I will have to try the cookie recipe…always a sucker for a cookie and a hot cup of coffee. Best wishes. Your pups are so cute! I like your new line of fabric and can’t wait to use them in a project. Wish I could get to Wisconsin and visit your shop again..it is such a treat!!!! Am enjoying this country fair blog hop. Lissa has really got some fun ideas! Hope I’m “IT” for winning one of your giveaways. Oldfashioned is my favourite. I love to read your newsletter. I love quilts and making them. I am living in Milano, Italy, too far away to follow any of your classes. I also always liked the county fair, and since our kids were in 4-H and we worked in the Parents booth with the band, we were almost always there! I love the little thread catcher! That would make a great gift for my guild friends for Christmas! As a p.s., I finally finished my Primitive Garden quilt……..I absolutely LOVE IT! I like the way the quilts in the first photo are displayed, the cakes look tasty & your puppies ar sooooo cute! I’m hoping I’ll be one of the lucky ones to win a give-away from you! All this fair talk is making me so hungry! I’ll have to check out your recipe after I finish commenting! Great idea…..a thread catcher….and it’s looks so easy to take along with you. Oatmeal cookies are my favorite. I’m going to have to try this recipe. I just received some Little Gatherings fabric and I love it. Thank You! Too funny Lisa, I remember those days too. County fairs, boys and concerts. Those were the days! Love your new fabric lines and absolutely love the thread catcher. You are such an inspiration! Keep going girl!! The sky’s the limit!!! the thread catcher is sooo cute! i am going to make one today. will make nice christmas gifts too. thank you. the cookie recipe looks yummy. unfortunately, my physical limitations won’t allow me to enjoy them. however, it looks like a good recipe. so nice of you to do this. your pups look so sweet. enjoy their company! hope to win and am grateful for the opportunity. thanks! Wonderful quilts and lovely doggies! I am a huge fan of your entire site. I love all your fabrics new and old and have recently discovered the world of wool. 8 completed projects so far and many more to come! Thank you for a chance to win! Love the fabrics, thanks for the thread keeper. I’ve shopped your booth at Houston and always enjoy seeing what you’ve brought. it’s the closest I can get to the actual shop. Your pictures are great – almost as good as being there! Thank you for the pattern. I have been looking for something to make as thank you gifts for one or two friends, and this will be perfect. I love your site and store. Visited once and hope to get back soon. Thanks for the pattern and the giveaway! Thank you for the chance to win Lisa. I have some of your patterns and I thoroughly enjoy your creativity. Love your blog and your patterns. Thanks for the giveaway! Love your pictures! The dogs are SO cute! I’ve never worked with wool, so that would be nice to win! Nice photo of the pups…Jeets is the GQ and Prez is singing ‘Cotton Candy Land’. I will be making a couple of those cute thread catchers for sure as the are easy, fast, and much needed. What a nice blog. Brings back memories of the fairs I attended. I never had the nerve to enter anything I made. Now I regret it! Cute project. You are so talented. The thread counter looks great and thou puppies are just so CUTE !! Beautiful giveaway. I have really enjoyed this blog hop. I love that you named your dog after Elvis! LOL. They’re both so cute. I LOVE this project! I am always leaving little piles of embroidery thread around the house and it drives my DH to distraction. I’m going to get to work on this today! Thanks for the chance at some Little Gatherings. I recently made a quilt of valor quilt and used some of it in there. Perfect! Great post!! I love your stuff!!! Thanks for the great giveaway!! What a lovely post! Beautuful pictures. I love your quilts (alzo the disposal) your project …..and all!!! A routine stop when I go to Appleton, I love your shop and patterns. You are definitely busy….. Thanks for sharing your talents. My bucket list has on it – travel to Wisconsin to Primitive Gatherings to shop. I’ll make it, until then I’ll just enjoy your the eye candy you give us and buy on line. Love the pups! The puppies are so cute! My sister is a big Jeeter/Yankees fan. Is Prez singing? By the way, the quilt is gorgeous. That thread catcher is a brilliant idea. I end up with a little pile of threads next to my work, then my daughter comes near the table, it all gets bundled up and moved out of the way, and I spend my next hand sewing session sorting all the rubbish thread ends from the good bits of embroidery thread! I have so loved reading all the posts about the fairs! When we lived in Maine, they had the best county fairs and we went every fall to one or two. These posts sure get me pining for all the smells, tastes and eye candy! Thank you for the little thread catcher. It’s just adorable and a quick and easy project. Have a blessed day!! Those are great country fair pictures! The quilts are beautiful. I love cheese–many kinds, but not fried! I hope I win some of your striking fabrics. I didn’t get to the fair this year either and we have so many around us to choose. But am having fun visiting all the sites in this Country Fair Blog Hop. A great idea! I think this is my first visit to your blog. Your pup is so cute, glad the Benadryl worked. I didn’t know you could give it to a dog. I love flannel for quilt backs, but I have never thought of making a whole quilt out of one. Not that much real cold weather here in NC. Love the new section with Lisa’s recipes! The Whoopie Pie recipes has become a family favorite here. I also love the new line and hope to win a few extras for my stash. Happy to see someone from WI has joined the Moda team. Love your fabrics and also your booth at the Madison show this year. I’m inspired by your minis. Thanks for the chance to win. Thank you for the great giveaway… and the pictures of the quilts at the fair. Very inspiring!! Great pictures. Of course, I love the puppy pictures the most. I would love to win some of your new fabric line too! Terrific giveaway! Love your puppies! Your so right, the county fair is really fun. Ours is a 4H fair so it is especially fun to see what the kids are making. I had some surgery 3 weeks ago and since I can’t do anything, I am working my way through your 9 patch book. Right now I have the peony wreath and the vintage 9 patch started. Great fun! Thanks for all your great projects. Thanks for the pattern and recipe Love your work. Thanks..
Love the thread catcher, I need several of those when I work on quilts. Love the quilt and the Moda gals. Such talent. Meet the puppies when I come to Primitive Gatherings? No problem. See you at wool weekend in Nov. Yeah! Love your blog and your fabrics! Great photo of your dogs! Beautiful primitive designs – Thank you! You gave us the pattern for the thread catcher at the Gathering earlier this year; I have made a couple and love them. Thanks for that and I would love some of those flannels. Great post! Love your pups too. Are they boxers or pit bulls? First of all, love your pups picture! And your fabric is terrific, right up my alley. Thanks for the chance to win. I look forward to touching all of your fabrics, patterns, and yummy wools in Georgia next month! I’m just starting on your snowman wool framed picture pattern and I’ having a ball. Beyond perfect! Someday I will make it to “your house”! Thank you for the recipe. With oil instead of butter AND oatmeal it is really a health food! The pattern for the thread catcher will be useful – I may make them as gifts and fill them with oatmeal cookies wrapped in cellophane. What a great little gift for a hand sewer. Thank you so much for sharing it with us. Love those pups and there names. I need one of those thread catchers! I’ll just add that to my list…. Thanks for the cool project. I would love to win some wool. Your little thread catcher is adorable! Thank you for sharing with us. The pups are too cute! Thanks for the project and the receipe! Also for the chance to win!! Thanks for the thread catcher pattern. Your dogs are adorable. Love the fabric !!! I really like your patterns and have decorated my home with several of your projects. Your new fabric line is just perfect. Thank you for sharing your creativity and thanks for this giveaway. Hope I win. Great post! How did you get the boys to pose like that? I don’t think there are enough Milk Bones in America to have mine sit still. Mine are a little bigger at 95lbs. each. We didn’t get them until they were 1 year and 2-1/2 years old (Father and son). We had a little “un-training” to do first! Thanks for the pattern and the wonderful giveaway. Cute thread catcher!! I’m bringing mine to Wisconsin in November!!! Thanks for the hop! Loved your post, especially the puppies. How cute are they. Just found your new fabric “Little Gatherings” at my quilt shop, have to make something, just love them. Thanks for a chance to win some. Can’t wait to see if you pick me. Keep up the good work. Lisa, GREAT pattern! Quilting friends have made these into individual candy dishes for a Church luncheon, very cute!! Thanks for all your great patterns, fabric & ideas. Keep up the good work!! Your cookie recipe sure sounds good, will have to try them. I really like both of your new lines of fabric, the flannels really look nice!! I hope to get to your shop someday! Am enjoying the blog hop. Thanks! thank you for pattern . i would like win the pack of materials! Thank you so much for the giveaways! I just received my Flower Penny Garden BOM, can’t wait to start! Thank you for the project and the cookie recipe! Really liked your post and pattern. The thread catcher is a great idea. Thanks for the giveaway. Love your blog. Your little babies are so adorable! Love the little thread catcher ~ Thanks so much for the pattern and those cookies sound sooooo yummy! Love your new fabrics, thanks for the giveaway and post! I am a new follower of yours. Great sight. Glad I found u. Love the thread catcher tut. Thanks for the giveaway. I love the post and I’m lucky enough to get to go to the shop whenever I feel the need! Ca’t wait to make the thread catcher I know just where it can go, next to my chair in the living room! Love your blog and puppies, glad the eye is better. Thanks for the recipe – believe there will be some oatmeal cookies in my cookie jar this weekend – and probably a thread catcher, too. Thanks for the giveaway, too. I heard about your header on Cupcakes and Daisies – it is lovely! And Jeets must be the dog on the left, and Prez the one on the right… they are precious. that’s the coolest thread catcher! Thanks so much! The pups are adorable! I have two “boys” myself -Gage and Gannon! 2 year old lab/shepherd mix, the nicest dogs ever! And two grown-up sons too! Enjoyed visiting your shop in person last year, and am a frequent online shopper! Love your designs, am currently working on your summer block of the week – a little behind, but who cares! I couldn’t read the magenta print, but I sure could see the pictures…thank you for the cute thread catcher pattern! Oh I would love to win your giveaway! Thank you for the pattern too! I’d love to add some wool to my stash for winter projects! I just checked and see you’re only 250 miles from me. That sounds like a fun overnight trip – before the snow flies. Thank you for the pattern. Always enjoy reading your posts. New fabrics are awesome! Thank your for the chance to win. What a great pattern, I still don’t have a thread catcher so all my pieces wind up all over my counter and floor. Oh. that food made me soo hungry!! Wonderful post, LOVE the Thread Catcher!!! what a nice post! i love so much your quilts and the way you have showed.. Thank you for sharing the pattern. I need to make one and stop wearing threads all the time! I love the Thread Catcher pattern! It’s cute and simple. I’ll be making several. Thank you! Love seeing pics of your pups! Cute thread catcher, too! Thanks for the project and the recipe. Love reading your blog. Being from Wisconsin I also love fried cheese! Thanks for the chance at the giveaway. LOVE, LOVE, LOVE PRIMATIVE GATHERINGS AND LITTLE GATHERINGS. I am so fortunate to be in DesMoines and be touchly feeling in their booth. The wool, the thread, Little Gatherings. I am in heaven!!!!! Thank you for the opportunity. Will be stopping by the booth, again, today. Visiting your shop and taking one of your wool classes is on my bucket list (some day) 🙂 Thanks for the giveaway and it’s been a lot of fun getting to know more about you designers on your blogs. Love your dogs. You do beautiful work. Lisa…..what a great pattern….luv it….now I won’t find little threads around the couch anymore. The Moda Designers blog hop has been so much fun….we sure got to know a lot about Moda’s AWESOME designers…. Thank you for sharing your talents and your time during this busy time….can’t believe Fall Market will be set up in just 4 weeks…wish I could be there this year. Thank you Lisa and Moda for your generous giveaway…keeping my fingers crossed!! Thank you so much for the recipe and pattern! It was great to meet you and see your wonderful booth at the AQS event in Des Moines yesterday! 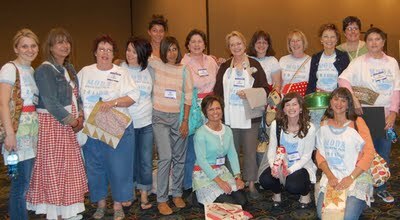 Although we were in your booth with a million other ladies all of them grabbing at your wonderful patterns and projects! I am just sitting admiring all the purchases that I made in your booth, the best booth at the event in my opinion! I love seeing all the exhibits. Thanks for much for the pattern and for the chance to win. The thread catcher will be very useful. Your fabrics are beautiful. Sure hope I win some. Exactly what I love at the fair too! Thanks for participating in the Hop! Those cakes looked good enough to eat! Love your thread catcher. Thank you for sharing! Lisa, your dogs were just so cute in that picture. They are really growing! Thanks for the pattern and direction for the thread catcher. I am thinking of a variation in wool. Maybe I’ll use it for my floss stash as I work on a project, it’s too pretty for catching just thread scraps. I love your newest fabric lines, can’t wait for the next! Thanks for a chance to win! Thanks for the chance to win a great giveaway. Thanks for the brilliant little thread catcher project – I can’t wait to make one and get rid of the old icecream container sitting on my sewing table. Love the new fabrics, especially the flannels. Thanks for the thread catcher pattern. Also thanks for the chance to win some of your awesome fabric. Love your blog and all the projects you show — such eye candy!! I wish I was closer to your store but that would definitely be TROUBLE but what fun I would have! You always inspire me to work harder and try different things. Keep up all the wonderful posts and projects you show us. I enjoyed getting to meet you at your booth in Des Moines. It’s always one of my favorite stops at the show. Hopefully, next year, you find time to go to the fair! Thanks for the chance! I love the thread catcher and will go through my stash today to find the fabrics for making one. Thank you for all the fun posted in the Moda blog this time. It’s so much fun to read your blogs. I enjoy the projects and the recipes and the fun stories about your travels. Thanks for the chance to win some of your new fabric. Those are very cool quilts in your fair picture. I enjoy reading your blog (on a regular basis) and it has been great fun to meet all the Moda designers. Thanks for the project, too. Thank you so much for the projects… I’m going to make that cute thread catcher today! The recipe and quilt block looks great… thank you for including those. I didn’t get to a big Fair this year, so this Country Fair Blog Hop has been a real treat! What cute puppies you have!! The fabrics look beautiful…just right for an autumn or winter project. Thank you for the great thread catcher pattern, I am always looking for something that isn’t breakable and this is perfect. I can fold it up without emptying in and put it in my stitchery tin when on the go! I first met you at Primitives of the Midwest and really enjoyed it. I love your fabrics and now the flannels are my fav.. Your BOM are always sweet and easy enough for novice quilters.. The tread catcher is adorable.Thanks for sharing..
awesome project, I’m going to make some as gifts. Another wonderful project for us! I love the thread catcher and the cookie recipe. Of course, I will have to make the star block…I love stars too. Thanks so much for sharing your life with us. This has made me love your site and and your even more. Cute little project…thanks! I petted the flannels yesterday at the AQS show and it would be awesome to win any of your fabrics. Would love to win any of your fabrics! So wonderful to visit your blog for the first time. I recently picked up a couple of LG charm packs and was planning to make the “Full House” Schnibbles pattern. Very sweet! What a wonderful pattern. Thank you. I love your fabric. It really works for me! Thank you for the opportunity to win. The thread catcher is a perfect idea….just the right size for the arm of the couch and close at hand for some buttonhole stitching on wool! Thanks so much for the chance at the exciting give-aways. That thread catcher is a wonderful idea. I love primitive quilts. Your fabrics are gorgious! Thankyou so much for both the pattern and the recipe. Both are great! Love the little thread catcher. Enjoyed reading all the different blogs during the fair! Lisa, you have another winner! I have the opportunity to visit your store regularly for therapy and for that I am greatfull! Visiting your site gives us quilters even more of your fabulous ideas! Your thread catcher and cookie recipe are ones I must try! Pups are too cute!! With names like those, they can’t help but be the best dogs…EVER! Love the picture of your dogs, way too cute. I have never been to a state fair, but after following the blog hop I think I am going to have to really try and go at least once. Thanks for the give away. I haven’t been to a fair in many, many years. This is one I can attend and not leave home. Now if they could just invent a computer that lets you smell the yummy fair foods. Love all of your work … Especially the wool projects. Picked up several yards of your flannels this past week while visiting the Midwest. Stopping at your store is on my bucket list for next year. Appreciate all of your hard work! 90% of them in one lifetime! Thanks for all your inspirations!!! Your dogs are darling. I like your design style as well; I go between traditional and prims in my decorating taste. I’d love to live in a log house. Thanks for the chance to win some of your fabrics. Love the thread catcher! Thank you for the giveaway; blessings! The new fabric line is wonderful! And I absolutely LOVE the picture of the puppies – it’s awesome!! Your dogs are adorable. How sweet! Great blog post, Lisa. I saw your new flannel line in a quilt shop this week and would love to have some. The softest flannel, ever! Thanks for the chance to win. With your gardening talents, I do believe you are a country girl at heart! 🙂 Love the new pic of the dogs – that must be Prez singing. Thanks for all the great things you create, and inspire us to create as well. Your talents are endless. Thanks for sharing and we’ll see you soon at the shop. Hi Lisa – this is my first visit to your blog. Love your County Fair pictures. I live in Rhinelander & have relatives in Neenah so will get down to visit your shop one of these days. Can’t wait to see your flannels. Give those doggies a hug – so cute. What a lovely little pattern. The dogs are .really cute .Thanks for a chance to win fabric from your line. Those dogs are the cutest things yet!! Love all that you do Thank you for the pattern and recipe. And also thanks for the giveaways. Thank you for a chance to win. What a cute little project, I’ll be making one of these little thread catchers. Your quilt picture from the fair makes me want to head straight to my sewing machine and get busy. Thank you for the chance to win some of your beautiful fabrics! Your puppy dogs are so cute! Thank you for the cute patterns and I may try the cookies this afternoon with my 4 yr old. Fun post! Love the thread catcher and fabric. What a great post. Thank you for the thread catcher and your block pattern, and I love any kind of oatmeal cookies. I saw your red and white ‘Quilt in a Day’ . Do you have a pattern for it? I looked in your store, but didn’t see it. Would be perfect for DD who lives in CO.
Ahh Lisa, I remember the 4 H fairs in Wausau and Athens during the years my daughters Amanda and Brandy rode horses in 4H. Sad how time flies. Thanks for the great blog, I love reading them, almost as much as I enjoy shopping at the store and staying with Terry at the Gathering! Love the dog pictures! Thank you for the opportunity to win! Cute dogs! Beautiful fabric!! Thanks for the chance to win!! I love your new line ‘Little Gatherings’. A couple of weeks ago a friend and I went to a quilt store during the local quilt shop hop and saw 2 bundles of this as soon as we walked in. Needless to say, we snatched them up as quick as we could. However, I could always use more! Your dogs are so cute! Thanks for the freebie and the chance to win, I love your fabric! Thanks for a great blog and a great little pattern. The photos are fantastic and the pups are simply adorable! Thank you for sharing such a great post. I would love to win some of the Wool and Needle flannels. I have the perfect pattern in mind. I just love all of your products and your dogs!! I visit Primitive Gatherings on line daily!!! Our Fryeburg Fair starts on Sunday and I hope to go this week. I also believe in a past life I was a farmgirl!! I would love to win any product of yours. I look forward to making the little thread catcher this weekend. Enjoy fall!! My dream is to also come out an stay at the Gathering< Someday!! Great blog post! The thread catcher is so cute, thanks for sharing the pattern. I love the photo of your dogs! I was fortunate enough to visit your booths in Paducah this year and I love your patterns and fabrics. I whipped up my Itty Bitty Pinwheels kit right away after getting back home and now I’m ready for 45 and Life to go. I LOVE that quilt. Keep up the great work! I was thrilled you were at the Cincinnati show. Hoping you come back next year. I love your wools. I think it is safe to say that I am your biggest fan 🙂 I have been following you forever and truly love everything you do. It’s like you read my mind and then design for me personally…he, he, he. I am currently trying to finish your 2011 Summer BOW and am hoping I can get it done be the end of this year. I really did try to do a block a week, but after 3 weeks fell behind (story of my life). So glad you are now a Moda designer; they picked a winner when they picked you! Keep up the good work and know that you continue to inspire not only me, but thousands (hmmm, maybe millions) of others. Love the quilt display! Thanks for the cute thread catcher. I love your thread catcher project..a great little gift idea. Love your puppies!! Thanks for the receipe – can’t wait to try it. So enjoyed your class when you visited Cullman, Alabama and enjoy all your your projects and patterns. Would REALLY love to win one of the gifts. Thanks for the fun stuff you show. Have fun at the AQS in Des Moines!!! Love the little thread catcher. How come thread seems to make it to every room of the house! Thanks for the giveaway. Cute Doggie People. Thanks for sharing your blog with us. I would love to give one of your gifts a nice home. I love the cute little thread catcher and have already made plans for it. Thanks for the recipe and b lock and a chance to win! Hi , Love your blog. Great pattern Thanks, it’s very useful…Hoping to be one of the lucky winners. Lisa I love your fabric lines! They are all the colors I didn’t have great amounts of and they blend so well with the stash I already have. Can’t wait to use them. Loved the adorable thread catcher pattern. Saw Nick and you at the AQS show yesterday-your booth is so inspiring! Like usual had to purchase quite a few beautiful wools and valdini threads and some kits and patterns! Love your posts about your dogs-such handsome fellows. Thanks for the giveaway and the yummy looking cookie recipe-enjoyed your blog! Your dogs are so cute. I love your Little Gatherings fabric. Thanks for the recipe. Love, love, love your fabrics!! The Thread Gatherer will be a perfect Christmas gift for stitching friends. Thanks for sharing. I love your fabric, and I am glad your dog is O.k. what a great little project. I think I will make one to add to a gift I am bringing to a quilt retreat!!! Love your blog, and cute little dog. Hi Lisa…I’ve been waiting anxiously all month for your Country Fair blog! This has been a lot of fun. Thanks for the pattern and recipe and a chance to win some of your beautiful fabrics in the give away. The little Thread Catcher is perfect for all my hand/wool stitchin’ friends. Love your shop and your new fabric line! Can’t wait to see what your next line will be! The thread catcher is so cute. Thank you for sharing the pattern and the chance to win some creat fabrics. Your puppies are darling. The way that the quilts are displayed caught my eye, it’s a great idea. What adorable puppies! Thanks so much for the giveaway. Love all you do, Lisa. Keep up the good work! Wonderful posting and fun to read, love the thread catcher, great gift idea. I LOVE the picture of the dogs! My favorite building at the Minnesota State Fair is the Creative Activicies building, with all the quilts, handwork, and baked items. Thanks for sharing the Little Thread Catcher pattern. This will make for a great “just a little extra” Christmas gift for some quilting friends. I LOVE your Little Gathering line so much I already have two fat quarter bundles, plus yardage to make both the Little Northwinds and 45 and Life To Go quilts (I turned 45 this year, so it will be fitting). The Wool & Needle Flannel fabrics look beautiful, would love to have some of that line too. Keep up the great work that you are doing, it is appreciated! I love oatmeal cookies and will have to try your recipe. I love the new Little Gatherings line and I imagine the flannels are just as wonderful. Thank you for the giveaway! 🙂 I have never been to WI, but it sounds lovely, and I would for sure stop by and see your shop! Cute recipe for the thread catcher…thanks! thanks for sharing the little thread catcher pattern. too cute. 12 prizes. Wow, thanks for the giveaway. Maybe I have a chance. I just love your designs and fabrics. I love your puppies!! So enjoy your patterns and can’t wait to try the cookie receipe. Sounds yummy! Really enjoyed your class in Cullman, AL. Hope you’ll come back to see us in Sweet Home Alabama. Of course, I’d love to win one of the prizes! I love the thread catcher, my fav project on the blog hop so far!! Your fur babies are the cutest! 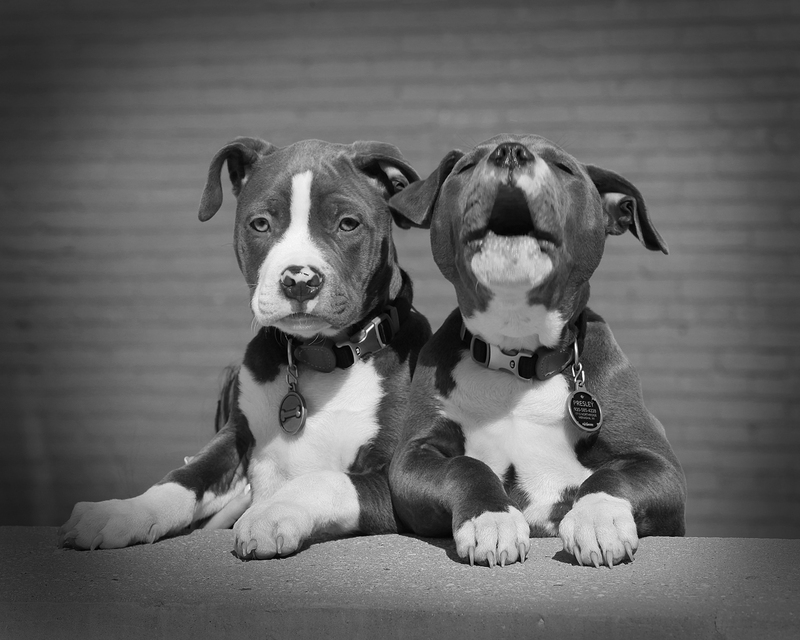 I have two boxers and just love the bully breeds…they are the best!! Thank you ..thank you for the cute patterns and receipe. I just love all your stuff!!! I’m still working on my summer BOW blocks, but will be taking time off to make your darling thread catcher!! Am hoping I win your fabric in the drawing. It’s so wonderful!! Love the thread catcher – plan to make it a girlfriends Christmas gift and the cookies, who doesn’t love Oatmeal cookies and frosting with them-Yum. Sounds like a great afternoon with cookies and sewing is in the future. Love all your patterns. Thanks so much for the thread catcher pattern it will come in handy. Absolutely love your “little gatherings” collection. Gorgeous! What a fun read! Thanks for the giveaway! Prez and Jeets are very cute. They look like fun to have about. Your fabric is beautiful. Hope I’m one of the winners. Thanks for the pattern for the thread catcher. I currently use a coffee can so this pattern is a good one for me. Thanks Lisa for the great pattern. I will have to make that one – too cute. I LOVE your shop and it’s been my annual summer stop for the last five years – I love to visit your website quite a few times a week to view the “new” tab. Have made many of your wool applique patterns. Keep creating your beautiful patterns! Love the doggie pictures. Thanks for the thread catcher, now if it will automatically catch my threads!!!! Can’t wait to see you at the end of October, I am scheduled to take your class in Georgia. Thanks for the giveaway!!! Thanks for the giveaway! Hope you have a good day quilting! FINALLY! The blog post I’ve been waiting for! I love, love, love your blog, patterns, and fabric….just my style! Applique is my favorite technique, especially WOOL applique, and I love how much your new flannels look like wool. I’ve been searching locally for your Little Gatherings line with no luck, so if I don’t win it 😉 guess I’ll have to order it online! Actually I’d be thrilled to win any of your designs!!! Thank you for the cute thread catcher pattern. You are so talented! Thank you for sharing your creativity. Thank you for the fabulous pattern! I could have used one of these the other night at church where we were working on sewing projects, so now I can make for the next time. I love your block pattern and the oatmeal cookies sound divine. I also love the chicken quilt in the top photo–gorgeous! Thank you for a wonderful sharing post! The thread catcher is cute – it’d also be a fun way to present small gifts or some candy! What a great give-away – would love to win. Have made all your recipes and this looks like another winner. Cute thread catcher – would make great Christmas gifties. Thanks. I love your fabrics! Thanks for the chance to win in your give-a-way! Have a great weekend! 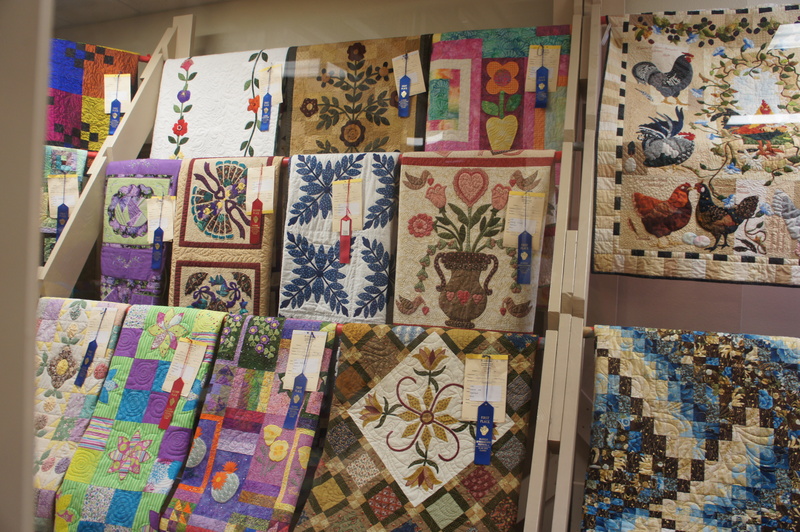 PS – the quilts in the pics above are really gorgeous and there is a lot of variety too. Our fairs typically only have 1-2 quilts. This blog hop is so fun. Thanks for sharing all of your ideas with us. Thanks for the giveaways too. Love all of your work, especially the wools. Picked up some of your flannels this past week while visiting the midwest – they are beautiful! I appreciate how hard you work to make us happy. Visiting your store is on my bucket list for next year-can’t wait. Thank you for the thread catcher pattern.and the chance to win some of your fabric. Very cute dogs! I love your stuff! It all has such warmth. Moda was lucky to add you to their line up of designers. Thanks for all your designs and sharing your cute puppies. Those quilts at the fair are so pretty. Your thread catcher pattern is great. I used the new laminates for the inside of mine to make the threads fall out easier when you empty them. Have a great time at the BIG quilt show in Des Moines. We’re having beautiful Fall days for your visit. Sorry but it’s impossible to read your Fair answers on your black background. It’s so sad the hop has come to an end, but they saved the best for last eh? The thread catchers are cute & sooo easy, Thanks!! Lisa, I live in Temecula and would love to take a class with you the next time you visit here. I think you got your beautiful boys here. I love your new line of flannel wools and small prints. What a cute project – and exactly what I need! thank-you for the chance to win this awesome fabric. Love the puppies! I love the thread catcher! What a great idea, I am always putting my scraps of threads on my table beside the couch and sometimes forget to pick them up and throw them away each night. I will be making one of these for myself and my mom. Thanks for the project and a chance to win! Love the quilts @ the fair. So inspiring! Thanks for the recipes and the giveaway! Love the thread catcher. Need to make several for all the places I stitch. Can almost smell the cookies baking. Thanks for all your inspiring projects. Wow, you jogged my memory! A tractor pull was a first date for me too! So much fun. Love all of your stuff, bought a lot of your kits, patterns, fabric…………Love it all. Wish me luck! You are such an inspiration. Puppies & quilts, what a combo! Enjoyed the post, and the quilt is gorgeous! The flannels sound lovely and your thread catcher is great! Thanks for doing a fair post and giveaway. I do occasionally like to quilt with flannel. Would love a chance to win either of your new Fabric lines. Love them all! The pups are so cute! Thanks for the pattern for the thread catcher! Thanks for sharing your design. Love your fabric lines and thanks for the chance to win. I would be THRILLED to win one of your prizes!! Love your new fabric lines! Also your thread catcher is wonderful…can you guess what everyone is getting for Christmas this year!! Thanks so much! Loved reading your post. Your dogs are too cute! Thanks for the giveaway. Love the thread catcher. It would make great Christmas gifts to my quilty friends. Thanks for sharing. The Blog Hop has been such fun. I’m sad to seeing it coming to an end. I love your Little Gatherings line – my favorite fabric ever! I’ve already bought some, but would love to win more. I want to make sure I have enough to include some in every quilt I make! thanks for the thread catcher pattern, fantastic photos.. Thank you for the chance to win – I’d love to win your fabrics or wool. I enjoy reading your blog, I follow with Google Reader. Lovely photos and fabrics! I will have to make the thread catcher. The final quilt is wonderful! LOVE your patterns, fabrics, and blog. I have been gathering “Little Gatherings” fabrics as I find them in our local quilt shops, the whole line is wonderful. Thanks for all of the great ideas! Cute puppies! Love your patterns and fabric. Someday hoping to come to your shop. Thanks for the opportunity to win some wool! Cute project!! Even cuter dogs!! Thanks for the great giveaway!! I loved your picture from the country fair. Quilts and baking — maybe the best things at the fair. I’ve never entered a quilt, but when I was a teen, I entered a fudge-frosted chocolate layer cake and won a ribbon. Cute thread catcher. Beautiful fabrics! I love the thread catcher pattern. I can’t wait to make one (or more) and put them to good use! Too bad you didn’t get to the fair this year, but your photo of the quilts from last year is great. So much creativity in each one, they certainly deserve to be winners. Thanks for the thread catcher pattern. I usually just throw everything on the floor and vacuum it all up when I finish my project. Love your work. Thanks for the giveaway. Hi to Dex & Pres! I love the pattern and the recipe, going to have to make both soon! Love your post and the quilt with the blocks from all the different Moda girls is beautiful! Love the fabric and your blog is great! Thank you for the wonderful Thread catcher pattern, recipe and Patchwork Pudding block pattern. WOW! What a great day for us!! Been waiting all month for your blog. Now I’m really looking forward to your newest line that hasn’t hit the store here where Iive. What would we do without our best four-legged friends? What do you do with your dogs since you travel so much? I love Wisconsin cheese, too! Yum! THanks for the giveaway. Love you work. Thanks so much for the give-away! And the dogs are adorable! I’m working on your summer BOW, but am a little behind. It’s going to be the best ever! Thanks for your great designs. I’ve been following them since you started under your old name. I love the thread catcher idea. Thank you. Your picture of your dogs is so cute. Oh dear. my original comment is still waiting for moderation – but I have already made the cookies and they are delicious! Love the thread catcher — love your puppies!! Love your new fabric line!! Thanks so much!! I have been waiting for your pattern and love it! I visited your shop last summer and hav been the envy of all here in upstate NY. I use your site as inspiration and have two BOM going…I should spend less time on here and more sewing. Keep creating and thanks for your inspiration! Go Yanks! you are so right, nothing beats fried wisconsin cheese curds. i love your patterns and your shop. Love the thread catcher pattern. Also think that one of the pictures on your nightstand is of your 3 boys when they were little. I have the same type of picture on mine, except with 2 girls and 2 boys. I have several of your patterns and would love to win any of the fabrics to use in making some of them! would love to visit your shop one day. I always enjoy your booth at Houston Quilt Festival. that thread catcher is great and looks easy…great gift idea. Thanks for the thread catcher pattern…much better than walking around the house dropping threads off my clothing! I’m off to download your threadcatcher pattern! Oh I am so sad the Blog Hop is almost over… I have just recently started quilting and I look so forward to this everyday. I thank you for your little bag pattern, can;t wait to make it. Oh how I wish I would have started quilting long a go, I love it and there just isn’t enough time in the day. Lisa, I love the new Moda with the antique look. Beautiful fabric line! I read your blog all the time, not only to look at the beautiful things you make but to hopefully see a picture of the dogs! Love the dogs! I am actually putting the binding on a quilt made out of your Little Gatherings fabric (still wouldn’t mind more) and it is making me very happy. Can’t wait to see more from you. Your patterns are great and your first couple lines make me want to sew even more! I love your new line and would love to win one of your give-aways. 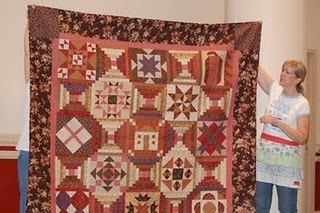 I make mostly Civil War and Primitive quilts, so you are one of my favorite quilt designers. I”m thrilled that you now have a fabric line. Love the Thread Catcher!! Thanks for the pattern! Thanks for all the inspiring pictures you put on your blog! Love looking at them! Your pups are absolutely adorable. The thread catchers are so cute. Thanks for sharing! Fabulous! All of it. And I heard that a lot of your fabric and wool loooooves coming to SC so I’ll just go down to the mailbox at the end of the lane and wait for my prezzie. Thanks Lisa! thanks for the pattern and recipe! thread catcher-brilliant. Loved your post! That picture of your pups is wonderful. How did you get that one to howl? I scrolled down and saw Jeter and his bee sting. Ouch! I enjoyed getting to ‘meet’ you in your blog today. I am new to reading the blogs but this bloghop has really gotten me into them. Thank you for the patterns and recipe. I think I will make the cookies very soon. thanksks for the patterns and recipes! Great blog! The dog on the right looks like he is singing!!!! How cute they both are. The thread catcher is great. Thanks for the pattern. Thank you for the chance to win a fabulous prize. Thanks for the patterns!!! Plan to make the thread catcher for little Christmas gifts by using left over Layer Cake squares. Cute doggies!! Thanks for the opportunity to win, especially the wool flannel. Your doggies are so cute!!! Love your creations too! I love your new Little Gatherings and Wool and Needles Flannel. The flannel is to die for. Thanks. I love the thread catcher pattern thanks for sharing and the cookie recipie sounds yummy I will have to give it a try. Looking forward to trying your oatmeal cookie receipe. Also love your Little Gatherings fabric. I love your thread catcher project and will make one today. I am a fan of your patterns and you always inspire me. Your new fabric line is beautful and I would love to win some. Thanks for your blog today!! Really think your project is easy and a great way to use up some smaller pieces of lovable fabric. Hopefully I’ll be able to add some of your lovable fabric into my stash to use in one of your great patterns, so thanks for the giveaway. Those quilt pictures from the previous fair were really outstanding – thanks for this wonderful opportunity to win and for the generous giveaway. Jeets and Prez are posing so nicely – beautiful dogs. Judy C.
I’m with you about spending a week or a lifetime at a spa. We could relax and stitch. Love your new fabric line. The quilt is beautiful ! Thank you for the pattern…can’t wait to try my own block ! I’ve never heard of self-frosting cookies…can’t wait to try them too ! 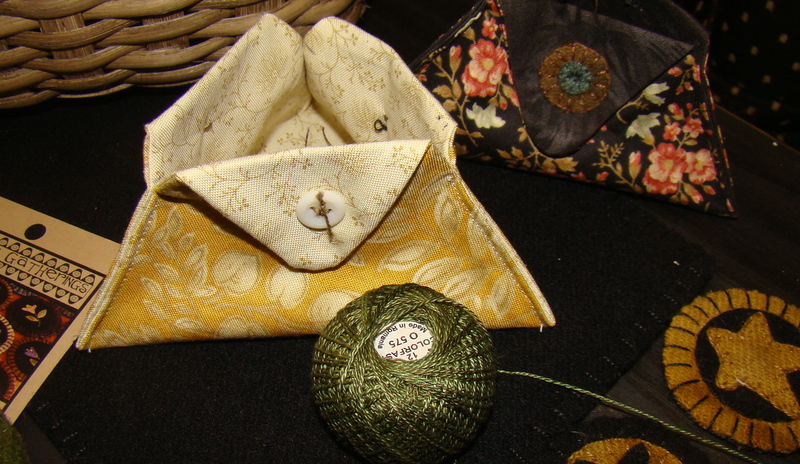 Love the thread catcher….I’ve always wanted to make one! Now I have no excuse! I’m anxious to see/feel the flannels. Little Gatherings is a classic to say the least! I’m hoping to meet the dogs when I visit the shop and stay at the retreat house in a couple of weeks. I can hardly wait to get to WI where it is cool! You may be looking forward to coming to Georgia where it is still hot, although cooling off this weekend finally! Cute pair of puppies! Thanks for a chance to win. Those cookies sound scrumptious. I can’t wait to try them! Thanks for the give-a-way chance. I really don’t like clipping threads. Maybe once I make one of these cute thread catchers I won’t be so hesitant to clip the little buggers! Thanks for a fun pattern! Thank you for the pattern. Love your fabric, in fact just bought some a couple of weeks ago, now have to find a great use for it…it was an additional stash builder at this time. Thsnks, those cookies sound wonderful. I enjoyed your post. Thanks for the project! That block is so pretty, I’m going to give it a try. The cookies sound delicious and I love your block. The quilt looks so good – all the collections just seem to go together. I’m going to make your thread catcher – I’m hoping it attracts the threads because they get everywhere. Beautiful fabric. I hope I get to be one of those random picks! Your new fabrics are the “talk” of San Diego!!! Soft and cuddly for sure!!! Thread Catcher! I have an excited to make one, because I have never seeb one before and I have been quiltingg for 20 years or more! Neat! Love your furry friends – what would we do without them? Thanks for the pattern as I have been lusting for it since I saw on your blog a visiting group made those thread catchers. Now I can make my own and have it when we visit you in October. Looking forward to our visit to the “house” and the shop. Thanks for the chance to win. Your quilts are beautiful! I am definitely going to make the cookies and the thread catcher! Would love to win also! Love your work. Thanks for the giveaway. I enjoyed your post. What kind of dogs are Prez and Jeets? Thanks for the useful thread catcher pattern. Its gone to my to do list. Love the fabric colors. Cute thread catcher and thanks for the pattern. I think I will place mine by my laptop. I always find some little futz that needs tossed whenever I am online. See you at the fair next year! ‘Love your fabrics & Wisconsin (UW-Whitewater graduate). The puppies are adorable. Thank you for such a cute project. My husband and I both really like oatmeal cookies, so I will definitely have to try this recipe. And thanks for the opportunity to win such great prizes. Love your dogs! Your little ort bag is so cute, thanks for the pattern. Love your patterns and the pups are so cute. I have to tell someone…my beiges and backgrounds are my biggest stash of fabrics (so far). I can’t resist when I see a beautiful beige or tan!! I would love to win your fabrics, they would be right at home with my fabs! Thank you for the cute thread catcher pattern. I visited your shop last week and loved it! Love all your fabric so would be happy to win. Looking forward to seeing/buying your new Christmas line. Thanks for being you, Lisa, … and all that you do for us!! I did not make it to a fair this year either. I am enjoying the Moda fair hop and all of the pictures posted. Would love a chance to win some of your gorgeous fabric. The cookie recipe sounds great. Thank you for the thread catcher pattern and a chance to win one of your give aways. Love your blog! Thanks for the chance to enter your giveaway. Love your fabrics, love your books and patterns and designs. When I come to your booth at shows I’m afraid you’ll charge me rent I stay so long!!! Keep coming, I’ll keep buying and stitching. Just finished Red Pine and several projects from 9-patch Gatherings. Love them. Thanks for the giveaway. Love those puppies!! Love your dogs!! So cute!! Can’t wait to make another quilt. Thank you. Thanks for the fun post, the block is neat. It was good to see you in D. Moines. it’d be great to win!! Love the pattern! Really need to make one of those. I tend to get fabric scraps and little threads all over me, the floor, the dog and every where! The thread catcher is real cute. Thanks for the giveaway for the wonderful fabric. Lisa, I’m in Wisconsin right now, visiting from Houston, TX. I went to your shop yesterday for the first time. Loved seeing the shop in person. I’ll see you at Festival in November. I am just now getting familiar with your fabrics, I have a couple of applique projects in mind and think that your new line will be perfect for the job. Love your post and your puppies!! Thanks for the cute pattern and the awesome giveaway. Now I want some fried cheese curds, fair food is so much fun. Thank you for the thread catcher pattern. It will be so handy. Love your patterns and kits. Also, your booth at the Long Beach International Quilt Festival and at Ontario. Your puppies are darling. Would love to meet your dogs some day…and visit the shop….and stay at The Gathering!! Thank you, Lisa for the thread catcher pattern. I think I will make these for my stitching friends for Christmas. I have some of your fabrics and love them!!!! I love Primitive Gatherings. Hope I see you at PIQF in a couple of weeks. I’m excited that your giveaway includes wool/flannels. Ooo, the thread catcher is a lovely idea! I’ll have to make up a few of those for gifts and such. Those howlin’ puppies are so cute. Is Pres the one “singing” in the photo? The thread catcher is very cute. Joining the blog.. I love your patterns! Pick me, pick me! I love your stuff! You’re puppies are sure cute. Thanks for the pattern, I will be making several of these. I bought the FQ bundle of your Little Gatherings line for Moda, just have to decide what to make. I am looking forward to the flannels next. I love your store, your designs and just everything. I would love to win some of your fabrics since no one near me in Richmond Virginia carry your stuff. If I ever get to Wisconsin to hunt my fathers relatives, I’m coming to your store and staying until you kick me out! Thank you for the thread catcher pattern and the chance to win some of your fabrics. Have never worked with wool before, would love to try it. Lisa — thanks for the cute thread catcher… very unique and can be used for many other things… just a neat little display as well. Thanks for your pattern. I saved it so make later, nice idea. Hope to see you tomorrow when I stop by your booth again. Your booth btw is so wonderful! I even made a purchase of one of your charm packs of 100 lites and darks. Love them!!! The guys running the register T The booth were real cuties, do they belong to you? These dogs look so cute and I love anything primitive Gathering makes. Too bad contemporary seems to be more the norm in Penn State country but one day I’ll make it to your shop, on my bucket list. Would love to win! What a cute thread catcher! Can’t wait to make it for a gift. Thanks for the chance to win, thanks for the pattern, looks like a project to make for gifts. Would love to win some of your fbric!! Such cute dogs! Thanks for the opportunity to win a prize. The quilt really turned out beautifully! I love everything you do and want it all. I am sure everyone has said the same thing so I understand all their responses. One of these days I see a visit to your shop. Your thread catcher is just darling. I will also try your cookies. Thank you for sharing with us. WOW !!! How extremly generous of you! I To be honest I had never been to your blog before today. But after looking around, I’ll be back!!! Love the thread catcher…perfect to have by my side stting in my chair and doing some stitching. Thanks!! and thank you for the opportunity to win some of your wonderful fabric. Love your fair photos. Thanks for the thread carrier, very useful, also a quick gift for my sewing friends. Thanks for a chance to win your beautiful fabrics! Have a great day. Thanks for the recipe and patterns, the thread catcher is so neat ! Thanks for your generous giveaway, keeping my fingers crossed … Happy Fall !! Thank you for offering all of the great products. I am fairly new to wool applique and have really enjoyed working with your patterns and kits. I can’t wait to see what’s new! Thanks for the thread catcher pattern, very useful. Thanks for a chance to win some of your fabric. You have a great shop in Wisconsin. The cookies sound yummy and like the fact that oil is used. Thanks for the nice pattern! You books and quilt patterns are great! I love the thread catcher, thanks for the great idea. The quilts are so beautiful. And the desserts looked so yummy. Thank you for offering such a generous giveaway! The cookies sound delicious may have to make them today!! Thanks for the recipes !! Love your patterns, material designs, and reading your blog! The quilts from the fair are amazing. I’d love to pay a visit to the shop! Love the post! Great quilt pictures! Thanks for sharing! I love the thread catcher! Oh your puppies are so cute! I am having cuddle withdrawals though because my kitty had to go in to get fixed today. I would love to win some of your beautiful fabrics! Thanks for the thread catcher pattern – this is one I could see myself making and using. 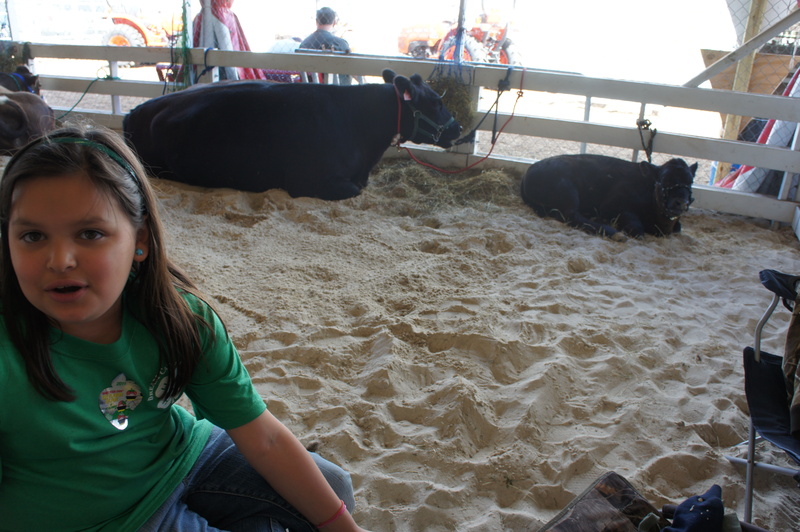 I am a farm girl and I love fairs. I also love your fabric! Pick me! I wish they displayed quilts that nice at our fair, wow! Love those food display cases too! Thanks for the thread catcher pattern. Love your designs and have made many of them and want to make many others.!! Thanks for the great project & post. Like the way they displayed the quilts at the fair and your puppies are so cute-who doesn’t like dogs? I have been waiting all month for your post and you certainly don’t disappoint! Thank you for everything. I missed seeing you in Des Moines this year. Bucket lists were mentioned in earlier blog hop entries. A trip to Primitive Gatherings is on mine!! Thank you for the little thread catcher pattern. Just the thing to make for my quilt group friends for Christmas. Thanks for the project and giveaways! Thanks for the pattern and lovely giveaway! Love the thread catcher! I think you just solved my dilemma regarding what to make my quilting family for Christmas! I enjoy the post and would love to win…. Loved your post and I am adding you to the blogs I follow! Love the thread catcher, it will make a fun and quick gift for my quilting group. Thanks so much for the pattern! This has been such a fun hop! A thread catcher! That’s so awesome! Just last night I was stitching and I was telling my husband how I never have a spot for my thread ends (they usually end up on the floor). I am making one of these tonight! Hmmm, maybe I’ll make more than one. I have more than one stitching spot. Jeets & Prez are adorable…..I love your picture of them. Looks like one of them is singing to you. Great post, Lisa, you certainly know how to multi-task. You continue to amaze and impress!!!!!!! Love you new fabric line, love your fair pictures, love your wonderful patterns, and most especially love those 2 critters of yours. Thanks for the chance to win. Have a great weekend in DM, Iowa. I have no doubts it will be good. Thanks for the cute post. It has been quite fun learning a bit about all of you–love the Jason Aldean stuff great choice in music 🙂 I just LOVE the little project you did, cute & usuable! Lisa, I love the thread catcher! And I also love your wool projects! Your a great designer. Love your patterns and fabrics. Thanks for the recipe and little thread catcher pattern. Super cute thread catcher! And those flannels look amazing! Great giveaway…. I actually have some of the wonderful Wisonsin cheeses in my store – maybe I will have to put going to a fall fair in Wisconsin in my bucket list! Love your pictures – in particular that beautiful quilt with the applique medallion and the quilt made from your fabrics. I’ll keep my fingers crossed! thanks for the pattern. a the cookies. Oh, that is a cute project! I love your fabrics and patterns! What a cute dog photo–adorable—-thanks for the chance to win the fabric–I love your patterns…. Okay, I would have posted to the blog sooner but I wanted to make a batch of your cookies first. They are chilling now. Thanks for the family fun. And thanks for the giveaway too. I love having all shades of brown and beige in my stash. Oh how I love your new line! I haven”t decided which quilt to make with, something with lots of stars I think! And the sweet puppies, thank you for the wonderful giveaways! Your new line is just the best!!!! Can’t make up my mind which is my favorite so will be making a major investment with Little Gatherings! Your dogs are sooo cute! And thanks for the pics from your fair,especially the quilt pics! Thanks also for the great giveaways!! Thanks so much for sharing your cookies and block pattern. Also thanks for the chance to win. Always need a thread catcher, thanks. You have the neatest ideas and patterns! Love the Thread Catcher and already in love with the new fabrics!! Thanks for the giveaway. Love your work. Thanks for the giveaway. Give the boys a hug. Thanks very much for participating in this fabulous hop. Your puppies are adorable. Thanks as well for the great thread catcher pattern. Love your blog & thanks for the free pattern for the thread catcher! Hope to sew one together this wknd. Jeter and Presley are adorable! The thread catcher will work great for my knitting projects, too. I created several piles of snippets last night, working on an afghan for my soon-to-be grandaughter. Love your pattern. It’s a great pattern to make for friends. I check you blog frequently and really enjoy all that you do. Still trying to leave a comment. Perhaps it was saying that I had already made and eaten some of the cookies that keeps me in moderation! Lovely pictures of the fair. Hope to win some fabric of your new line!!!!! I love that threadcatcher! So cute! Hi! Your puppies are sooo cute. They look so happy. Really like yor project too and it’s something we all need and much better looking than a paper bag – ESP at a class or retreat. Cute. I looked at the receipe and it sounds real yummy so maybe I can talk my daughter into making some as I don’t cook anymore. Thank you very much for the project, receipe, the pattern to your Moda block and a chance to win some wonderful fabric. The quilt is beautiful. It looks like the dog on the right is singing. How cute. Your little dogs are truly handsome dudes! You have many fans here in the Netherlands!! Love your fabrics so much. They go wonderfully with my ‘style’ of quilts. Hope it’s my lucky day and I can add to my stash. Can’t wait to make the thread catcher! Love your patterns and fabrics! I enjoyed your fair post! Thanks for the recipes and great patterns, too. I love your threadcatcher. It is so very different from any other that I have seen before 🙂 Thank you so much for sharing. Thanks for the pattern. Like your doggies too. Your quilts are beautiful. I enjoyed your website. I’m jealuous that you are inn Des Moines and I’m not! Enjoyed the stroll through your blog. Thanks for the recipe (I will try it but must admit I have never heard of powder sugar on oatmeal cookies before) and the patterns. I will utilize those as well. Your little thread catchers are so cute! And who wouldn’t LOVE some of your fabrics! I loveyour store,your blog, and your ideas. I recently bouught in Madison at the Expo. I still use your tips and tricks for appliqueing wool. Great job. Keep up the good stufff. Thanks for the giveaway — I was born in Milwaukee but now life in California. Love your fabrics and would be so happy if I’m a lucky winner. Thanks for the pattern too — I need to make one for myself and my sister who is a quilter also. Love the threadcatcher pattern and your blog. The picture of your fur babies is adorable. They are so cute! Thanks for the chance to win. Lovely project! Thanks for the post.It is great fun to blog hop! Gorgeous Quilt. I like the colors and block designs. Thanks for the chance to visit your blog and learn more about you. Of course, the giveaway is great too. I love the pattern, recipe, blog, fabric line and everything….I am a great CA fan of yours….looking forward to your trip to Yuba City….can’t wait !! I got to visit your shop this summer while visiting new twins. Thanks for the pattern and the chance to win! The thread catcher is so sweet as are all the youngun’s! Love the quilt on your header! I love your new fabric line and would love a chance to win. Thanks for the give away. What a fun post. I’m hungry, I want to quilt and now I want a puppy….smilo. I can’t really read what I’m typing with these pale letters so I hope it comes out okay. What terrific quilts! Thanks for sharing them. My fingers are crossed. Love the pictures of the quilts at the fair, definitely would love to meet all the food that one the ribbons in the showcase. Never had fried cheese, might have to try that next. Thank You for the threatcatcher pattern, the block and the recipe. I wonder if those frosted oatmeal cookies are as good as the fried cheese. That’s a great thread catcher. I’ve never seen one like that and really like this one because it sits on the table. The others have always had the part hanging over the table and those I am always knocking onto the floor. This is wonderful. Thank you. Those cookies look very interesting with a name like ‘self frosting’. That sounds awesome in my book. I LOVE those two puppies in the picture. Such an adorable pair of cute little faces. And oh my gosh, all those quilts at the top of your post are beautiful. Wonderful job on those. Thank you for the great tutorial and recipe. Thank you for the pattern & recipe, (yum). I love your patterns, wool, & books (thanks for the bonus recipes, I’ve tried them). Thank you for the chance to win some wonderful fabric! Would love to win one of your giveaways – Love the primitive gatherings patterns. I’m just starting to work with wool and love it! Thanks for the thread catcher pattern! I’m going to make some of those for friends for little Christmas gifts, I think. Can’t wait to get to the store sometime soon! Oh I love that thread catcher! I love your designs, have many of your patterns and only wish for the time to complete them all! I hope I win!! Thank-you for the cute little thread catcher. Good giftie for my sewing friends. Would be nice to win some of your fabric to make them with. Thanks! I enjoyed talking to you at Madison Quilt Expo. I love your little dogs. What cute faces. Very cute thread catcher! Beautiful quilts on your blog, too! I’ve learned you can’t make an ugly quilt with Moda fabric! Love your fabrics , great thread catcher pattern. Thanks. I love your pups!! I want them, can I have them please? Just kidding, but they are so adorable! I love your blog, having been following it for a while now. Thanks for the pattern and recipe and a chance to win something. I’m not from WI, but I love fried cheese too or any cheese for that matter. CUTE thread catcher! Love your designs!! I shall make the cookies for next Tuesday ‘s guild meeting. Thanks! Cute dogs, great pictures and goodies from you what more could a person want!! Love the photo of the quilts at the Fair! Such a sweet little threadcatcher bag. I think it would be perfect to hold my earbuds (for my iPod). oooh, love the needlework photos; love to see all the hand make things at the fair! Love your blog and all your designs. Such cute puppies and lovely fabric. I enjoyed reading your responses and would love to be entered in your giveaway. Thanks for the chance! I will definitely be making some of these thread catchers – great project. I love the threadcatcher. My mind is wandering — what else could it be used for? The cookies sound yummy. Thanks for the chance to win some fabric. Love your dogs. Nice blog. Thanks for the cute thread catcher pattern. Can’t wait to get your new fabrics. Love your blog and all your designs. Wish I lived closer so I could come and visit your shop–maybe some day. Looking forward to seeing you in Georgia in Oct.
Love your fabric – it’s such a basic. I NEED it. Thanks for the threadcatcher pattern, can’t wait to make it! I enjoy following your blog, and my once a year visit to your shop(warehouse sale). You have the sweetest dogs! It has been fun following their lives since you picked them up in California. Thank you for the thread catcher pattern……..a neat idea which I have not seen before. And thank you for the chance to win quilting goodies! I look forward to your updates to see what is going on. I check you website often. What a cute thread catcher pattern…..I think I will make one right now to scoop up my pile of threads! Thanks for all your designs! So love the pic of the dogs. What handsome boys! Love the fabric. Cannot wait. Thanks!! I saw a thread catcher like this somewhere a few days ago and was wondering how to make it! Thank you so much for the pattern!! I sure wish I lived close enough to come to your shop!! Well, mybe it’s good thing I don’t!! I would not have any money left AT ALL!! I’m really dreading this blog hop coming to an end! I have gotten so many patterns and ideas to use for Christmas presents! I’ll be making more presents than ever this year!! Love the pattern,thanks for sharing I think they’d make wonderful Chrissy gifts for a few of my sewing buddies this year 🙂 Barb. LOVE all things PG …lol! I’ve never been disappointed in any of my PG kits or BOM’s, I could be your number 1 ‘online shopper’ fan in the UK …lol!! I keep hearing about fried cheese- when I get to the States I’m going to have some of this, it sounds delicious! The thread catcher is seriously cute, thank you for the pattern. And making those cookies sounds doable for me, I like the idea of oil and not butter in cookies- they must be healthy! This is not another comment but just to apologise because my email address on the previous comment was wrong. It is now the correct address. Beautiful photos. thanks for the great blog tour stop. have a great week. I love how you have arranged your post. Your thread catcher is lovely too. I like your site. just bookmarked it for further viewing. Thank you so much for offering such great patterns & wools. I am new to wool applique and am truly hooked on your great pattens & kits! I can’t wait to see what is next! Ahhh the fair. We actually got Styx and REO Speedwagon here. That was pretty good for Plymouth, Wisconsin! Great post, Lisa! I would love a chance to win some wonderful goodies :o) See you in the shop this fall! I was thrilled to see The Titanic to be one of your favorite movies! My 14 and 10 year old grandchildren pick that movie to watch when they stay with me…they both know the entire script! I love it! Our fair is going on right now here in Yakima, Washington. Sad to say I haven’t been for so many years…I was told about an absolute beautiful quilt at the fair made by and 18 year old boy…it was his senior project. I hope my friends take a picture of it. Ohhhhhhhhhhhhhhhhh how I wished I lived closer ….we need a quilt shop here in Yakima just like your awesome shop…..visiting your quilt shop is definitely on my bucket list!!!! I love the thread catcher. My mind is wandering — what else could it be used for? The cookies sound yummy. Thanks for the chance to win some fabric. love all the pics of the quilts at the fair!!! Thanks for the thread catcher pattern–great quick gift for my quilting friends! Your dogs are so cute. I love the Little Tread Catcher. Thanks for the pattern. Absolutely love your new line of fabric! Enjoyed your fair blog and photos. That thread catcher is a great little pattern, and would make nice gifts also. Am new at wool applique, so any of your giveaway items would be more than welcome here at my house lol. I enjoy your website very much, and took a quick liking to the Valdani threads. Love the thread catcher. Thank you for the pattern. Thanks for the “Thread catcher”…that’s exactly what I was looking for. Also, I really like the quilt square. Looks easy enough to do with some of my free time between sewing and all my other activities. I love the little thread catcher. Love the quilt as I do all of your stuff. I am looking forward to seeing your shop in person this fall. I will be shop hopping thru IN, IL, and Wisconsin Oct. 15-20th. Your thread catcher is great and the cookies sound yummy. Thanks for the chance at your giveaway. thank you for the thread catcher pattern. I can’t wait to try your new fabrics; I’ve used the muslins in 2 of my quilts and love them. It was great to see you at Feather Princesses in Tampa; hope you come again soon. Those quilts are so pretty. I love your thread catcher! So cute. Thank you for the chance to win! oh yeh, there is always more room for some yummy fabric bundles. My loot is big, but I just love me some more fabric. Love your Little Gatherings line and looking forward to seeing the next new line. Your block is lovely – such a beautiful quilt everyone put together. Must try your cookie recipe. Thanks so much. Little Gatherings is my favorite fabric, I can think of so many quilts to make with it. Love the photo of your pets. I absolutely LOVE Primitive Gatherings muslin and the adorable Little Gatherings prints! They are perfect things to just have on hand when inspiration strikes. Your thread catcher might be a olittle gift for all my sewing friends this Christmas. Thanks for such a cute project. I love the idea of having a place for thread rather than just all over the floor. Thanks for the pattern. I would love to win some of your beautiful fabric! I love our local fall fair – I know all the ladies who enter quilts! The Little Gatherings line just came into my LQS – I bought the charm pack so that I could decide which ones I liked best but it’s too hard – I like them all! Thanks for the little thread catcher pattern and the giveaway! Cute thread catcher!!! I’m a BIG fan of your patterns and your love your new fabric line. Sure wish I lived closer to your shop…(But my husband is thankful we don’t for some reason!!!) Anyway keep those patterns coming! I really like the fabric! But I really love those cute dogs! LOL ! Seriously, though, I would love to win the fabric, it is beautiful. And the thread catcher is really neat. It could very well end up being a Christmas stocking stuffer for a couple of people I know. Thanks for the pattern. Love your fabrics and wools – such inspiration! I would love to win anything but will definitely come by to see your booth in Houston. Thanks for the chance to win! Thank you for the pattern and the giveaway. Your fabric is beautiful. Love, love, love those dogs!!!! Thank you for the opportunity to be able to enter and maybe win. Love the expressive looks on the puppies faces!! They are great! Thanks for the thread catcher pattern, that will be very handy!! I love the thread catcher. It is too cute to use for thread. I like the candy idea – maybe nuts would be good for fall. Buttons for a quilted project. Your dogs are so cute! The thread catcher is a great project. Thank you for the chance to win. Love the pics of Jetter and Pressly. Saw you in DM today and of course spent too much at your booth. Thanks for the great pattern and recipe! Jeets and Prez are absolutely darling – I just want to kiss their little heads! Thanks you for hosting this giveaway, you are very generous, and for being a participant in the Moda Blog Hop. I like your fair pictures, especially the quilt one. 🙂 Thank you for the opportunity to win some fabric. Thanks for the recipe! I’ve recently developed a milk allergy, and it was great to see a recipe for oatmeal cookies that didn’t include butter or other dairy! Wonder which oil you use in it… Hope to win some of your fabric…bet the Little Gatherings would be great for dresses for small dolls! What a great craft item! I think I will make some for our quilt club’s annual Christmas party!! Oh my gosh, Lisa – you’re a girl after my own heart! 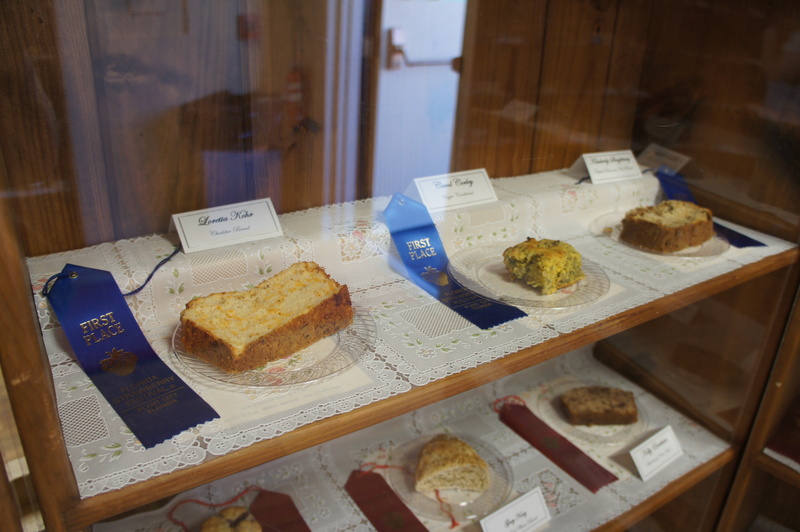 Loved the pics of the county fair … the quilts were beautiful and the food looked yummy! Loved your cute dogs – Jeets and Presley; we have Bichons Abby and Emmy. Your thread catcher would be wonderful to use and also make as a gift. Thanks tons for sponsoring the absolutely wonderful Primitive Gatherings fabric giveaway. A friend showed me a charm pack of Primitive Gatherings and I fell in love with it. Thanks for the insight into you, and the pictures of the fairs. This is so much fun! Cute idea for the catcher, too. Thanks for the thread catcher pattern. Thanks also for a chance to win some great fabric and goodies. Loved your post, your pictures are so lovely, andyour project is so sweet,I will make and use it for sure, have beena fan of your fabric for some time. Great job! Glad that bee sting wasn;t any worse for your sweet pooch! It looked so bad. How generous you are. This is very exciting, i love the fair. thanks so much. Keep up the great projects!! Love your seasonal wall hanging in the fall issue of the Primitive magazine; just finishing our shop sample!! Great Pattern! Thanks for the chance to win some fabric! Love the thread catcher pattern! Thanks for the chance to win some fabric and the pattern. Can’t wait to see the fabric in person….and the wool! Great pics of the fair! Thanks for the THread Catcher pattern. It has been so much fun reading each ones country fair tale. I love your blog…fabrics…patterns…thanks for the chance to win and the great thread catcher pattern! I love that picture of your dogs. They are adorable. My dog is a small lap dog. We have always had golden retreviers and this is such a change. Love them all. Your puppies are so cute! I love your thread catcher. It’s so different and unique. Thank you for the pattern as I want to make some of these. Thank you for such a wonderful blog. Thank you for sharing the pattern with us..I also like watching Pretty Woman, it’s one of those movies that you can watch over and over..lovely photos- one thing that intrigues me though is what fried cheese is like…. This fair blog has been fun, I had a problem reading some of yours tho, the purple/pink on the dark background was hard for “older” eyes to see. Awww, what cute names for your pets. So original! Thanks for the cookie recipe; I’ve printed it out to try this weekend. And the pattern for the thread catcher will make a sweet gift for a few of my friends who sew. Looking forward to more of your blog and hopefully a bundle of your fabrics. Love, love, love your choice of Jeets. We’re thinking of naming our next kitten “Jorge” after dear Jorge Posada. Thank you for a wonderful giveaway. I was at the AQS show in Des Moines this week. Your booth is always wonderful. I did manager to find a thing or two (more like 10+) to take home with me. Your samples or very inspirational! Love the new fabrics! Enjoyed your contribution to the blog hop — your fabrics are lovely. I am going to make your little project — it would be perfect for taking to my friendship group each week. I’m usually working on an applique project, and always end up with a little pile of threads — this is a great solution — thanks! The hop has been great…. fried cheese – love it!! Thanks for offering up great treats! Love your dogs, they are cute. Thanks for the thread catcher pattern and the oatmeal cookie recipe. I love oatmeal cookies that is one of my guilty pleasures. Thanks! I am looking forward to making the oatmeal cookies. Thanks for sharing the recipe. I had a wonderful time shopping at your booth at the Quilt Expo in WI. You are a real inspiration. My husband loves your quilts and wool projects too. Love your wool and needles! Just schedule it! I have the same guilty pleasure on a monthly basis! It’s wonderful! See ya tomorrow at AQS booth. I enjoyed our visit last year. It was great seeing you today – I love all of your stuff! Can’t wait to start on my “Summertime” kit! What a unique thread catcher! That is so cute. I love the little thread catcher and the dogs too! Thanks for the cool pattern. Love everything you design. Your shop is on my someday list. It has been interesting to meet the Moda family. I Love your fabrics-m ;ott;e gatjeromgs amd tje flannel. I hope you can read this. The print looks like black on black on my computer..
Hi, and thanks for the cookie recipe. The threadcatcher is so cute and unusual. I enjoyed the pictures of the quilts – particularly the one with chickens. Thanks for the chance to win. This blog hop has been a lot of fun. I just love your dogs…………I love most dogs. Then there is the fabric addiction!! I am just starting to understand and love flannel. Which ever you think would make a nice addition to my stash I would gladly welcome into my home. Your fair place looks like the one we had before the racetrack bought the land and it moved to a bigger better (uhuh ?) place. I tried to comment last night and something isn’t working for me. I’ll try today………love your pup’s. Thank you for doing the Country Fair Hop! Your pictures remind me of the fair I went to this summer – complete with goats, sheep and 100 chickens! Love the thread catcher, and the luscious fabrics! Love your fabrics and patterns. Thanks for the cookie recipe and the chance to win a great prize. Great Blogging! Awesome photos! Sooo sorry about Jeter. He looked horrid. Bet he felt worse than horrid. Glad he’s better….it’s pretty scary when something like that happens and they can’t tell us what it was. Thanks for a chance to win a giveaway. Have a great weekend! Love the little thread catcher , so sweet. Thanks for a chance at the treats, too! The quilts are gorgeous, I’m so jealous of all you ladies that have country fairs! Thank you for the pattern. I need to make myself a thread catcher. Sometimes, I am too lazy to get the waste basket. Lisa, thanks so much for the thread catcher pattern! They will make a perfect little gift for a few friends and family members! And the oatmeal cookies are on my to do list for tomorrow. I always enjoy your blog. Keep the posts coming! Thanks for the thread catcher pattern and cookie recipe, can’t wait to make them both! That is the cutest picture of Jeter and Presley you’ve posted yet!! Can’t wait to see the new goodies coming up for fall market! I alway enjoy seeing and visiting with you at Long Beach, CA. Can’t wait until next year. Can’t wait to make the thread catcher! I have been using an old margarine tube with a hole cut in it’s top….gee whiz, do I sound cheap! But I am married to the King of Recycling and he would have a heart attack if I tossed that into the garbage (we have limited recycling where we live). So I will make your pretty one and he can inherit the old one! Thanks for the pattern! No more threads on the floor! Whoo-hoo. Thanks for the chance to win. Thanks for being a part of the fun blog tour. And thanks for the very generous giveaways. I might go make one of those thread catcher’s this afternoon, I think it could be good to keep all my loose buttons in too. Thanks for the ‘tour’ & pattern, Tania. Thanks for the generous giveaway and the project. Like you we did not make it to the fair this year. Our granddaughters entered their bunnies in the fair and took best of show they were so excited. I love the thread catcher if you’re going to have to dicard thread it should be in something stylish!!! Love your stuff! This blog hop has been so special and I’m loving it. Thank you for such a generous giveaway. Fingers crossed. I love the quilt display. I can’t wait to try the oatmeal cookie (my favorite) recipe. Thanks for the giveaway! Dear Lisa: I have always admired your designs! thanks so much for the free patterns/projects/recipe. I really like your block too. Have a great end of the year and holiday season! Great post, thanks so much for the give-away. I got to see lots of famous country stars for free by ushering at the county fair. I love the smells, sounds and exhibits. Of course, we’d always go home feeling gritty because our fair grounds weren’t paved. Thanks for the the cute thread catcher pattern. I’ve never seen one like it. Thanks for the free pattern and I love your wool & flannels something I haven’t tried yet! I love that thread catcher! And the cookie recipe looks great–can’t wait to try it. Thanks for the giveaways–I hope I am one of the 12!! I absolutely love reading about all my favorite designers “my rock stars”. I’ve already made a thread catcher…what a great little project! Would make a great favor for a quilt retreat! Thanks! The pups are sooo cute. I love the fabric line and thank you for the pattern for the thread catcher. I hope I win your generous giveaway. Great post! Thanks for the chance to win a giveaway and the pattern! Thank you for the thread catcher pattern. I needed something new for our next quilt show. I love your site and patterns. What a great thread catcher,I know what I’m making tomorrow. Thank-you for the great pattern and the giveaway. Thank you for the pattern. Enjoyed your fair post, brought back good memories. I enjoy reading your blog and seeing all the places you travel and the items you make. Thanks for all you do. Thanks for offering a giveaway. Thank-you for the thread cattcher pattern. Hope I win some of your fabric. I love all of it. Love your website and your blog! Lovin the new wool and flannels. Colors and feel of them are wonderful. My quilt shop loved me when I got half yards of each of the new printed muslins. Probably like me again for the flannels. Been hoping you would share the thread catcher pattern. Thanks! Wanted : fabric for a few good projects. Starting with the thread catcher. It will make great quick gifts for my quiilting friends. I always look for your booth at the Des Moines quilt show. It is always crowded – but worth it. Thanks for sharing! I love the thread catcher pattern and think it will be very handy to put all those thread ends instead of on my table where my boys can reach them!! Enjoyed reading your blog! Thanks for sharing the pattern for the cute little thread catcher. Great idea. I’d love the chance to win some of your great fabric. I’ve already pieced and quilted the pattern “45 and Life to Go” as a store sample at the Fig Leaf in Fort Collins, Co, but would love more to play with. Love your designs. Thanks for the thread catcher pattern; I am forever walking around with bits of thread on me. Perhaps this will cut down on how many threads tag along. Beautiful Quilts! I found you through the MODA Country Fair blog hop and really appreciate the thread catcher pattern! Nice Post. Love your fabrics. What a clever thread catcher. Thank you for the pattern. Am glad to have found your blog. It will now be among my favorites. Thank you for the darling tute. It’s been fun visiting all the wonderful blogs, and the Moda quilt is beautiful!! Thanks also for the great giveaways!! Your puppies are so cute! Love your blog, thanks for the chance! Great post, very useful tutorial and I am sure I will try the cookies recipe. Thank you. Thank you for the tote, wilcertainly make it. I am a big fan of you. And love your fabric, so thanks you for the chance to win. This blog hop has been so much fun! Thank you so much for the cute thread catcher project, and for the chance to win one of the prizes!